Colours of Impressionism: Masterpieces from the Musée D’Orsay, which opened last night at the Art Gallery of South Australia, features more than 60 works curated to chart the revolution of colour that lies at the heart of the 19th century’s most important art movement. 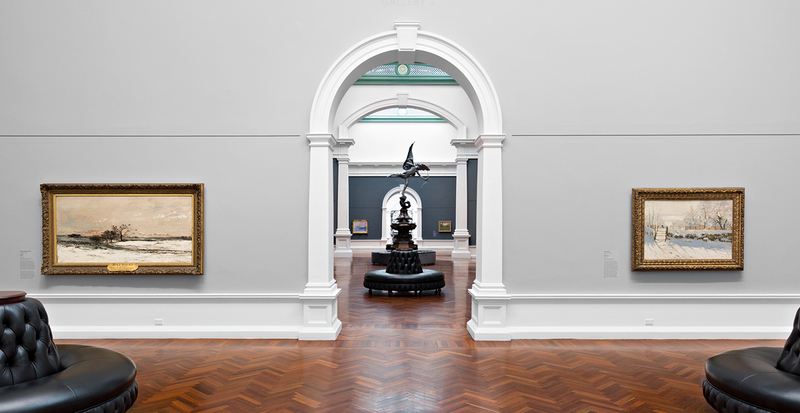 Paul Perrin, curator of paintings at the Musée D’Orsay, says the South Australian exhibition is special because it is housed in a building from the same era as the paintings and the large galleries give each artwork its own space. “The Impressionists painted these paintings to be seen in spaces like this, not a train station,” Perrin says. “The audience has time and space to look at each painting one after the other. Colours of Impressionism, featuring Charles-Francois Daubigny’s La neige (left) and Claude Monet’s La Pie (right). The exhibition occupies the Elder Wing of the Art Gallery, and reflects the architectural tastes among which the Impressionists lived, including vaulted ceilings and skylights. To host the exhibition, the building was emptied of more that 700 works and each of its five rectangular galleries repainted in shades of grey to emphasise the display’s theme of the revolutionary passage from dark to light. “The grey walls are ideal for the show,” says Perrin. 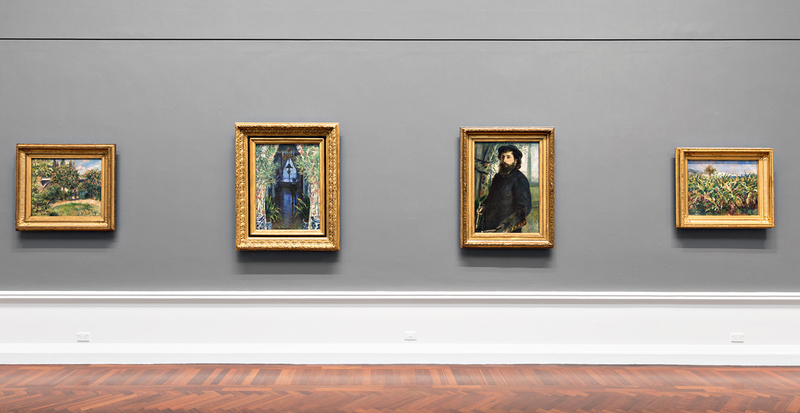 The exhibition begins with the dark tones of Manet’s Spanish-influenced paintings, hung on light-grey walls, and progresses through each separate gallery to the rich green and blue hues of the French countryside as painted by Cézanne, Monet and Pissarro, to the rosy pigments of Renoir’s and Morisot’s female figures hung on dark-grey walls. All the galleries are brightly lit with natural light. 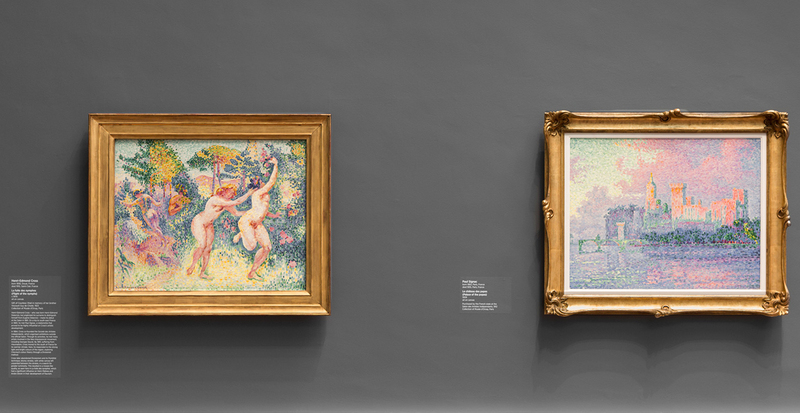 Installation view of Colours of Impressionism: Masterpieces from the Musée d’Orsay, featuring Henri-Edmond Cross’s Flight of the Nymphs and Paul Signac’s Place of the Popes. The sheer size of the Elder Wing – there is no more than 12 works in each of the five 300sqm galleries – means each of the 60 paintings has been given its own space. The space has also allowed Perrin to place works side-by-side that might not usually be seen together. “When planning the exhibition on paper, we had a plan of what would go where, but when we arrived we completely changed what we had in mind,” Perrin says. With this luxury of space, Perrin chose to place Gustave Caillebotte’s Vue de toits alone on one wall framed by an existing white arch. “It looks absolutely perfect,” he says. In Gallery Four, Monet’s Un coin d’appartement painting of the inside of his apartment and Renoit’s portrait of Monet inside the same room are positioned together (see above) to illustrate their friendship. “We saved the Le bassin aux nymphéas, harmonie rose and three other Monets for the last gallery,” says Perrin. Art Gallery of South Australia director Nick Mitzevich says the close co-operation with the Musee D’Orsay will help gallery staff to stage better shows and further the relationship with France. Colours of Impressionism; Masterpieces from the Musée D’Orsay runs until July 29, 2018, at the Art Gallery of South Australia.